Here on writelog.com is the only place the WriteLog team posts its digitally signed installers for DigiRite. Because DigiRite is published open source, it is easy for imitators to build packages that look the same. 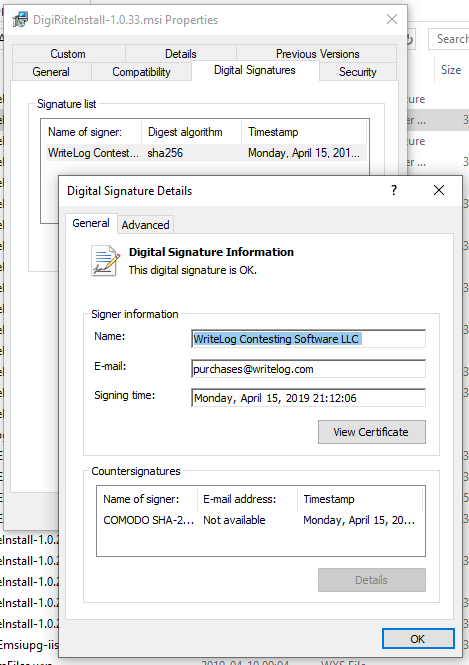 Be sure you have the installer prepared by the WriteLog team by downloading only from here, and also check the digital signature on the msi file. From Windows File Manager, right click the downloaded msi file, choose Properties, and then switch to the “Digital Signatures” tab.